I met Minnie and Rob in July 2011 (I was about 4.5 months pregnant). As with all initial consultations, I tell potential clients this meeting is for us to learn a little about each other and see if we all will be a good fit. I really do think that selecting a planner is almost as important as selecting your mate. Well, when I met Minnie and Rob, I knew that I wanted to be a part of their day. It was immediately apparent to me, how much they love each other. I also immediately felt so welcomed into their lives. With that first meeting, I was excited to be a part of their day. Minnie and Rob were such a pleasure to work with because they compliment each other perfectly. Their wedding day (two weeks before Christmas) complimented them perfectly too. 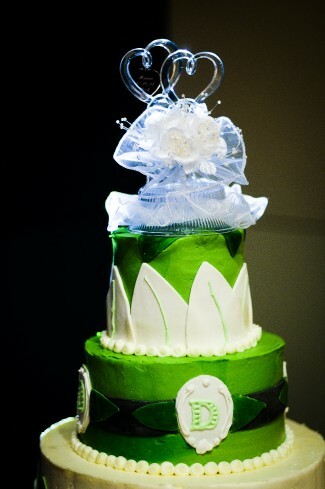 Minnie (a true artist) designed and created lots of their wedding elements: bridesmaid bouquets, mom corsages, boutonnieres, the wedding program, pew flowers, ring bearer pillow, the gift card box, an activity booklet for the kids at the reception and the cake...the fabulous cake! We truly were honored to be a part of their special day. 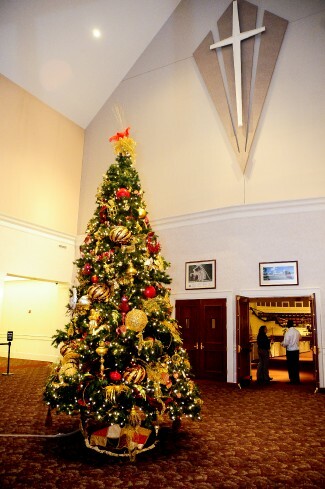 One of Brookland Baptist's 40 ft. Christmas trees! We love the personal touch that Minnie had added to her dress. We absolutely LOVE them! 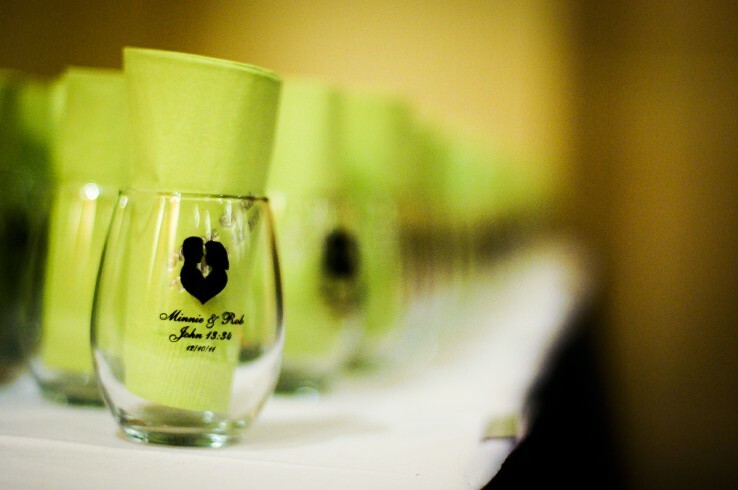 Rob surprised Minnie by having stemless wine glasses personalized as their favors. We had a great time working with Minnie and Rob. Our team, April and Morgan, did a great job taking the lead for Minnie and Rob's wedding weekend. As I mentioned earlier, when I met Minnie and Rob I was 4.5 months pregnant. 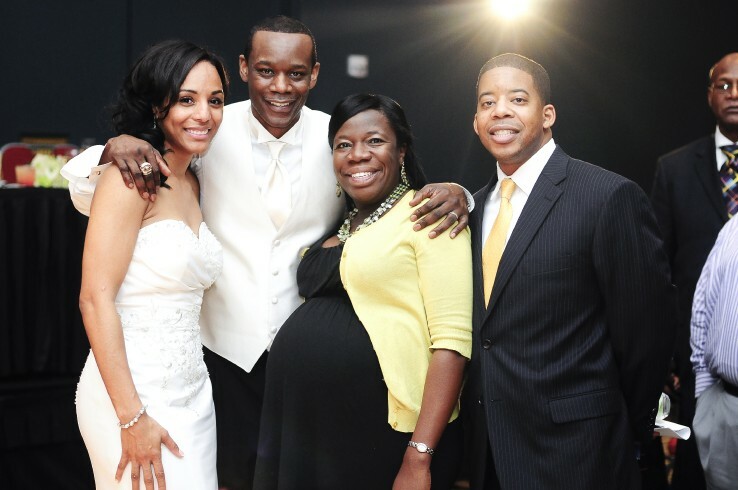 By the time we got to Minnie and Rob's wedding, I was 9+ months pregnant. My family's newest addition was born 3 days after their wedding. 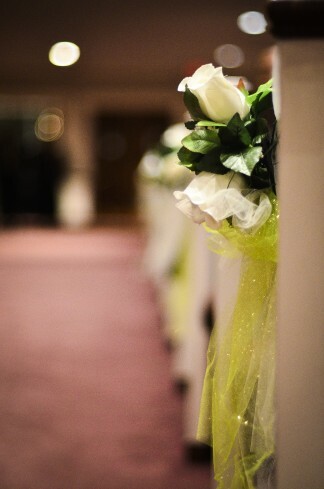 To see more of their special day, visit the Featured Weddings link on the Elegant Events website. Minnie Davis - I cannot express enough how much of a friend we found in Stephanie. Her work ethic, professionalism, energy, guidance and attention to detail made our wedding planning feel like a walk in the park; that goes a LONG way on the day of your wedding. Stephanie, April and Morgan teamed up to leave us with NO WORRIES and no stone left unturned. The cost versus the VALUE of having Stephanie as a wedding planner left us feeling like she may have been underpaid! 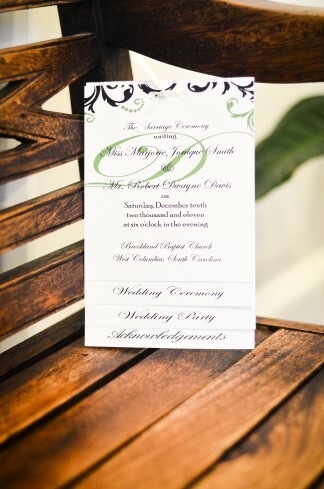 I am so sincerely grateful and blessed to have been referred to Elegant Events. Not only was she patient with us, Stephanie is a GREAT LISTENER! Those are hard to come by. 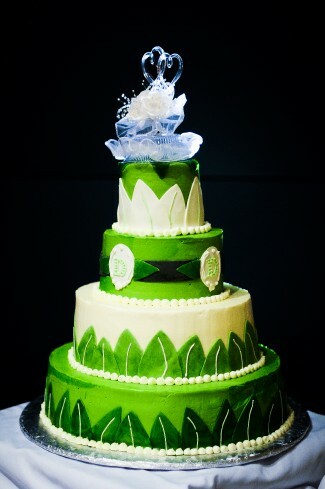 She listened intently and referred us to our cake maker, photographer and videographer: all of whom fit our personalities to the letter. It was like she'd known us forever! If you are second guessing the cost of a wedding planner, consider it an INVESTMENT in your mental health!!! I can't say this about all wedding planners, but I will refer Stephanie and the ladies of Elegant Events to ANYONE I know getting married. Looking back on our special day, Stephanie will always be credited with making it a relaxing, enjoyable, stress-free, happy and momentous occasion. We can't thank you guys enough!!!! Andrea - I LOVE that last shot too! Looks like a lovely wedding.